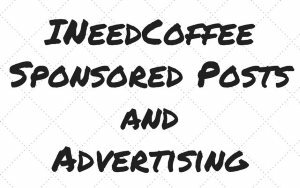 Whether you love Starbucks or hate ’em, you have to acknowledge their prowess for distributing and marketing coffee-related products. Well, they’ve done it again. On Tuesday, October 17th, 2000, Starbucks officially released a “new” coffee brewing system: the Barista Utopia. This is a vacuum brewing method, so it really isn’t new. What is new is the fact that this is an electric vacuum system. Most vacuum pots require a gas or electric stovetop or separate burner. This system was actually developed by Bodum and has been available in Europe for a couple of years. The styling is stereotypical “euro” in that it is both angular and sleek. Taking a cue from the popularity of the iMac, it exposes much of the inner workings of the machine and is available in two colors: clear and a see-through “graphite,” which is kind of a blue-gray color. It retails for $170 in the U.S.A.
Brewing coffee is pretty easy with this system. 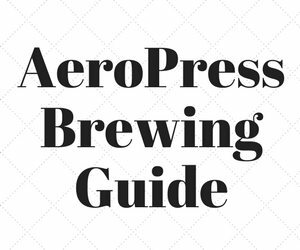 It is certainly easier than any other vacuum system that I’ve ever experienced, but it is a little more challenging than the average drip brewing machine. In my opinion, the stylish look, easy cleanup and programmable features of this brewing system make it a really good investment for any serious coffee fan. 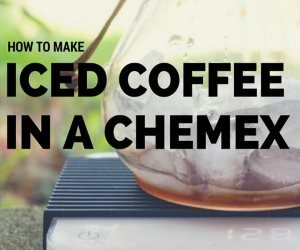 Vacuum pot brewing creates a coffee that is a real treat: it preserves many of the oils that one gets with the French Press, without as much of the sediment. Thus, you get a cup of coffee that is as clean as drip brewed coffee, with as much of the oils and richness as French Pressed coffee. When you first get the machine, you’ll probably watch the video. The included video will only tell you half the story and is surrounded by a lot of marketing frou-frou talk. If you make the coffee right away, you might end up with a bitterly brewed first cup. So let me walk you through the process in a more step-by-step fashion. Remove all the pieces from the box. Identify the coffee filter basket, filter and basket cover (the parts that sit on top of the carafe). Rinse these pieces with water and set them to the side. Identify the carafe and rinse it out with water, but never submerge the carafe in water. Plug in the base and set the clock. Fill the carafe with 6-10 cups of clean, cold water. Do not add coffee to the coffee filter basket yet. Before putting the filter basket on top of the carafe, use both hands to put the filter in place, creating a good seal; then put on the top of the filter basket. 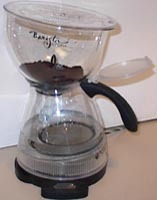 Place the assembled coffee filter basket on top of the carafe and place the carafe on the heating/power base. 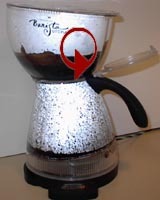 Turn on the machine and let it go through a “brewing” cycle without wasting your coffee grounds. Doing this will “season” the pot and remove most of the odd plastic tastes associated with manufacturing and shipping. If you skip this step, you will probably be less than thrilled with your first pot of coffee. 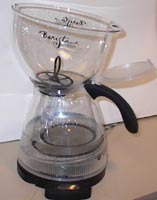 If you want to make a pot of coffee immediately after seasoning the Utopia, empty the carafe and turn the Utopia off. It is important that you allow the appliance to cool slightly before you attempt to move on to the next step. The included video from Starbucks indicates using 2 tablespoons of coffee for every 6 oz. of water. I found this to be a pretty strong brew. Unless you like your coffee strong, you might want to try lowering the ratio to 2 tablespoons of coffee for every 8 oz. of water. Expect to try a few times before finding the perfect personal ratio. The grind should be a medium grind, exactly the same grind that you would use with a drip coffee machine. Grind the coffee and set it to the side. Make sure that the filter has a good seal. To do this, you’ll want to use both hands to grip the coffee filter basket. Fill the carafe with the appropriate amount of water, in proportion to the amount of coffee that you intend to use. Note: you may not use the Utopia with less than 4 cups of water or more than 10 cups (20 – 50 oz.) of water. 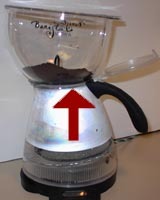 Place the carafe on the heating/power base, pull back the carafe lid and place the funnel of the coffee filter basket in the body of the carafe. 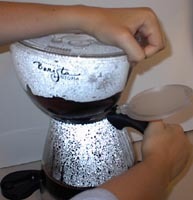 Pour the coffee in the filter basket and fasten the filter basket lid. Position the filter basket piece with the lid so that the grip area on the basket filter lid is aligned with the handle of the carafe. Make sure that the coffee filter basket fits securely so that a seal is created. Turn the machine on by depressing the on/off button. The brewing cycle will begin. The power light will illuminate, indicating that the machine is on. As the water heats, some will begin to rise. 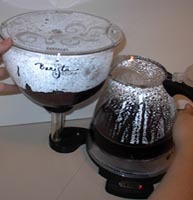 The water level in the coffee filter basket will rise and slowly saturate the coffee grounds. At a certain point, the majority of the water will make a dramatic rise into the coffee filter basket. A small amount of water will remain in the carafe; this is normal. The coffee will bubble and swirl. When the coffee is heated to 205 F (96 C), the coffee sensor temporarily shuts off the power to the base, and a vacuum is created. 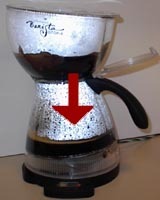 After the coffee has brewed for an appropriate amount of time, the brewed coffee will begin to drop back into the carafe. As the swollen grounds settle on the filter, the coffee will hesitate on the return journey. When the coffee has settled in the carafe, place one hand on the carafe handle and use the other to pull back and peel off the coffee filter basket and lid. The base has a special feature: a stand for the coffee filter basket’s funnel. Place the coffee filter basket in the stand, flip the top of the carafe into position and remove the carafe from the base. You can now pour yourself an excellent cup of coffee. The Utopia has two features that clearly distinguish it from the rest of the vacuum pot family and make it akin to popular drip coffee machines: a “keep warm” feature and a programming feature. The base will keep the coffee in the carafe warm for a total of 2 hours and the heat sensors will shut off the power base entirely if the carafe has not been returned to the base within 8 minutes. 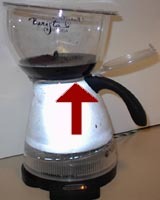 Starbucks claims that their keep warm feature does not continue to “cook” the coffee, but they don’t indicate in any of the associated literature exactly how their power base adjusts the temperature depending on the amount of coffee in the carafe, or how the heat is delivered to the system without cooking the coffee. Programming the Utopia is very simple, it’s just like programming a digital alarm clock. Press and hold the “Auto On” button for about 5 seconds. Then set the clock using the hour and minute buttons. Press the “Auto On” button again and a yellow light will come on, indicating that you’ve successfully programmed the machine. Just don’t forget to load up the machine with water and coffee before you go to bed. 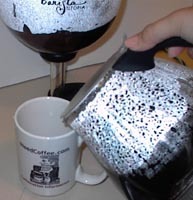 Vacuum pot brewed coffee is wonderful, and every serious coffee drinker should experience it. If you are ready to move past drip coffee makers, but you aren’t ready to commit to other, traditional-style vacuum pot systems, you might consider the Utopia. 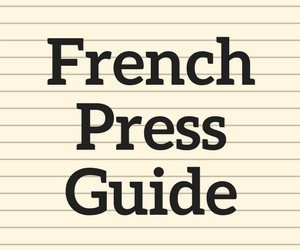 It combines much of the ease of drip coffee maker with the richness of the french press. Simply put: the Starbucks Barista Utopia is the easiest vac-pot system on the market.